Transit-Oriented Development (TOD) refers to the investment that takes place at and around transit stations or transit centers. TOD is often a catalyst for economic growth – improving access to jobs, housing and amenities, and helping promote active lifestyles and a reduced dependence on automobiles. Look for a major transformation of the area around the Grand MetroLink Station with the news that two new transit-oriented development (TOD) projects are now moving forward. With more TOD projects on the horizon, this part of St. Louis is attracting a lot of interest from developers and is poised to become a premier destination of the city’s central corridor. The Grand MetroLink Station is located below the street level of Grand Boulevard on Scott Avenue in a predominantly industrial area, while MetroBus service is located at street level on the Grand Bridge itself. Just west of the Grand MetroLink Station, Green Street Development plans to transform the old Armory building and surrounding land into a mixed-use development. The project will include a craft brewery, next generation office space, a restaurant and rooftop bar, and a health club and spa. Plans also include a hotel and a parking structure that will connect to both the Grand MetroLink Station and Grand Boulevard. The project will produce more than $80 million in investment and create approximately 700 new jobs. 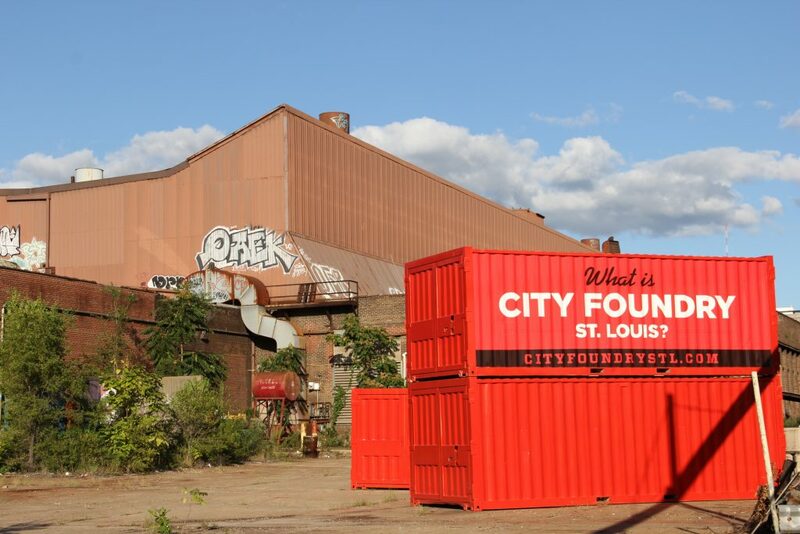 Lawrence Group is developing a project, City Foundry Saint Louis, just northwest of the Armory building between Forest Park Avenue and Interstate 64. This $340 million mixed-use complex will include a food hall, akin to Chelsea Market in New York, as well as restaurant, and retail and office space. The project involves re-purposing the existing buildings on the site, as well as additional construction, with the first phase of the project generating approximately 870 permanent jobs. A future phase is proposed to include both an apartment tower, with an estimated 280 apartments, along with additional new office space resulting in approximately 600,000 square feet of commercial space at City Foundry, when completed. Both of these projects will have many transit-friendly design features, including substantial public space, and bike and pedestrian-oriented streetscape design and landscaping. Phil Hulse, managing principal of Green Street Development, also identified connectivity via public transit as an important element to their project. One of the most exciting features of the developments near the Grand Station is an initiative led by Lawrence Group to build an elevated bike and pedestrian trail that will connect much of the station area with the planned developments, and will eventually connect to the Great Rivers Greenway trail system. Several partners, including Green Street, are working together to make the trail a reality. These two projects aim to create a transit-oriented, pedestrian and bike friendly environment, and an exciting destination and community in the city’s central corridor. Even better, these developments have the potential to serve as a foundation for even more investment and economic growth in the surrounding area.